Home › empathic interpretation › 4 Ways Empathy Misfires, Breaks Down, Goes Astray – Don’t Let This Happen to You! (1) Empathic receptivity is an intentional act directed at the affectivity of the other, at the animate displays of life that occur as feelings, emotions, sensations, appetites, passions, and affects are expressed. 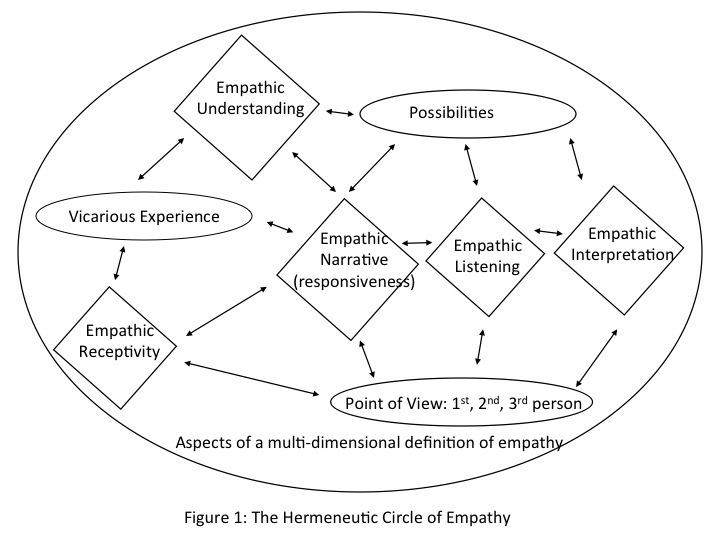 Empathy is not reducible to emotional contagion, gut reactions, or fellow feeling; but as embodied empathy it draws on the same way of relating, vicarious experience, as a form of receptivity to the other person’s animate expressions of life. If one were interrupted in the process of being open to the relatedness to the other individual in empathic receptivity, empathy would be incomplete and misfire as a form of emotional contagion, empathic distress, sympathy, or an affective reaction. (2) Empathic understanding is an intending of possibilities of meaning in recognizing the other in the other’s humanness. Possibilities are what get projected, distinguished, and determined in being understood projectively. “Projected” is not meant in the narrow psychological sense of egocentrism or attributing to the other attributes of oneself, though it has come to mean that derivatively. Rather “projected” includes within itself the very form of intentionality itself as “relatedness to”, “aiming at”, “sense of”, “meaning in relation to which”. “Understanding” is not used in the sense of applying a category according to rules of logic, though it does that derivatively, too, but as distinguishing a boundary between individual and other in which one intends one’s possibilities of relatedness projectively in the context of community, in which “projected” has the form of intentionality. Empathic understanding enacts a commitment in which understanding is focused on a possibility of being in relationship of meaning with the other individually and in community. Empathic understanding makes intelligible what is possible for the other, given the unexpressed commitments and involvements in which the other is engaged in her or his life. For example, one says one is committed to social justice but spends all one’s time and energy on automatic pilot and politics in one’s corporate or academic job and does not contribute to the community. One lives in an understanding of what is possible, even if one does so inauthentically and self-deceptively. What one can understand as being possible for oneself – the narrative one tells oneself – is the ultimate constraint into which one lives, even more so than the limits imposed by external circumstances such as schedule or finances. If one were interrupted in the process of empathic understanding, empathy would be incomplete and misfire as a form of resignation and cynicism about what is possible for human beings – requiring conformity, favoring inhibition over risk taking, living within one’s blind spots and prejudices. Over-intellectualization is also a high risk at this stage. (3) Empathic interpretation is the intentional act of unpacking, applying, and implementing the possibilities of which the other is the source. These include imaginative variations that transiently identify with first- , second- , third-person interpretations “as if” one were the other. Folk psychology grasps empathy as taking a walk in the other’s shoes. It is. However, one has to bring along the other person’s foot size and shape (and character, too), so that one has a sense of where the shoes pinch or chafe. The pain points provide access to the benefit of walking the walk. Thus, empathic interpretation distinguishes and “quarantines” one’s own beliefs, desires, emotional reactions, in the interest of being as fully present with the other person, as a first-person relating to a second-person. One is clear about boundaries between individual and other, but without filters, judgments, evaluations, or diagnostic labels. If one were interrupted in the process of empathic interpretation, empathy would be incomplete and fall back to a form of egocentrism, projection (in the narrow psychological sense), or merger with the other. I hasten to add, in general, there is nothing wrong with ecstatic merger; it is just not empathy. (4) Unexpressed empathy has a specific way of coming into speech. It does so as the intentional act of listening. Listening is the primary form of empathic speech. The paradoxical form has value in startling us out of our complacency. If left unexpressed, empathy would remain an irrelevant wheel that does not move one’s interpersonal relatedness. Empathy has to articulate itself to the other so that the other may “get” that the other is recognized and acknowledged in what the other is personally experiencing. Empathic speech is a form of optimal responsiveness that includes listening and responding verbally. Gestures of understanding, whether a handshake of acknowledgement or putting one’s arm around a friend, also count as forms of expression and responsiveness. Under one common description, responsiveness occurs at the beginning of the multi-dimensional process of empathy as an inarticulate form of language of listening in empathic receptivity. It also occurs towards the end as the one gives back to the other what was apprehended in the listening. If one were interrupted in the process of empathic responsiveness, empathy would be incomplete and fall back to a form of gossip, lecturing, or inhibited communication. Empathic responsiveness in speech is an intentional act that initially keeps quiet in order to listen. Empathic speech is privileged over verbalization in being silent to hear the other person as a possibility. However, listening is not the only kind of optimal empathic responsiveness available. Optimal responsiveness includes the paradigm case of the speech act of narrative (story telling) (Agosta 2010: 77; Agosta 2014: 6–7; Howe 2013: 175–176). When the other person’s experience is knit into a narrative as a useable whole in an empathic response from a committed listener, the response becomes a clearing for possibility and the person is able to access, integrate and own his experience in a way previously unavailable to him.